At the Lean Transformation Summit in Orlando last month I was blown away by a powerful presentation by Margarette Purvis, CEO of Food Bank For New York City. With the help of Jamie Bonini of TSSC they looked closely at the distribution of the food to their clients. Kaizen activities helped to solve a big problem, the lines. People stood in line for hours waiting for their food, outside, in the cold or heat, visible for all to see. They optimized the distribution of the food using Lean principles, trained the staff and got rid of the lines. Big difference for the people in the lines having to go through this every week. But no lines, no problem right? Wrong, the problem is now hidden inside. And even though I think no one should have to stand in line at the foodbank….they eliminated a symptom, not the problem. What is the biggest problem for a foodbank? Let’s dive into the facts for a moment. Food banks emerged in the United States in 1967 and the idea worked its way from Canada through to Europe. 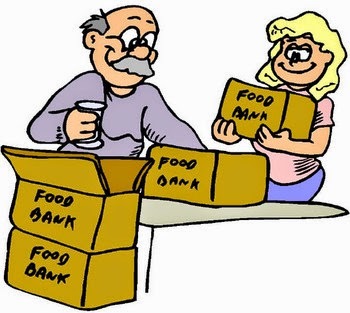 France opened the first European food bank in 1984. Belgium followed in 1986. Meanwhile, food banks in 17 European countries have joined the European Federation of Food Banks. In the course of 2009 the food banks also felt the economic crisis , businesses sit on their stocks longer and only allow their excess inventories to go to food banks just before the expiry date. This while the growth in the number of families that need the foodbank increased. Reality hits in 2013, food shortages at the foodbank. This led to waiting lists at various food banks. Reasons are companies are more efficient in production, and there is less waste. For food banks, it is becoming more challenging to get food. Food that would otherwise be wasted. Paradoxically only 0.3% of the amount of food wasted in the Netherlands reaches the food banks (Source: estimates by WUR and food banks Netherlands). Email or call your local foodbank and sign up as a volunteer. To make right what you have caused down the line for the hungry. Optimize your local foodbank through Kaizen activities (for free). Now? Yes right now. Thank you. The good news: all actionable points you assign as 'homework' are great ideas. I suggest and let us work together on the last point. The impact on reducing waste in the food supply chain is not that successful that it might seriously be considered a factor in the shortages the foodbanks experience. Figures range from 30 - 60% wasted food. (link to US source: http://www.nrdc.org/food/files/wasted-food-ip.pdf ) This is in line with the estimate of 0.3% of wasted food ending in a foodbank. The aspect of the growing number of people depending on foodbanks deserves more attention. What is the cause of people not being able to earn their living? There might be some (soul) researching to be done there as well. Maybe we should think of ways to create alternative solutions for these foods. People seem to be working from the hypothesis that the 'dumpster-divers' will buy the products if they are forced to. Let's think from a customer perspective. There is a great demand for free food. Why not aim for this?